SONICrider will keep using social media and you can visit the various platforms using the social links on each page. Wonna miss noting? Subsribe to the newsletter by using the contact form and fill out “newsletter” as subject; SONICrider will sent newsletter when there is some real news for you as a SONICrider friend. Designing the home page was choosing an image that reflects where SONICrider stand for when playing live, even in the studio playing new tracks as if it is a live performance makes recordings a unique moment in time. Photographer Rob de Kruif, who photographed several SONICrider gigs created a source of fine pictures to choose from. 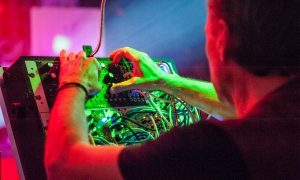 Picking one wasn’t easy, at the moment this is my favourite (playing the Moog Mother 32) during a gig at the “Stroomhuis” Eindhoven – The Netherlands during a Modulab Eindhoven event “Liberating Electronic Music”. Wonna thank Rob for this great picture.